Ever heard someone say 'Everything is Relative" or "There are No Absolutes"? Ever think about how they are 'Absolute' statements on 'Relativism'? You think that someone might say it like this "Maybe Everything is Relative" or "There may be No Absolutes". Growing up in the Half Empty Land of New York City definitely skewed my life with a predisposition towards half-emptyism. 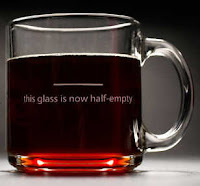 I am challenged to believe that the cup is half full. I used to cloak my cynicism saying that "I am a realist" ... pretty funny when I think of it. How do you see the glass? Please leave a comment and let me know. How cool is it that I was reading your blog when this new post popped up! Now there is a full cup. Inconsistent consistency. Love that vanilla. My glass is always overflowing! I have a hard time with the glass being half full but I'm working on it! I kept hearing this statement lately: there's no right or wrong. Heard it too many times for my liking. I get that Pearlie. A recovering black and white thinker like me really loves simplistic right and wrong answers. For sure there are times when those (right or wrong) answers are appropriate. Yet in matters of ideology or theology, I find that way too many people love to play the I am right and you are wrong card. But that may not be what you were commenting about?